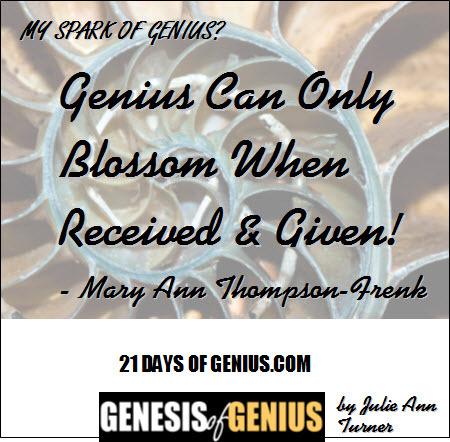 17 Genius Can Only Blossom When Received & Given! as you share the floor. and I give thanks to Creator for it!" 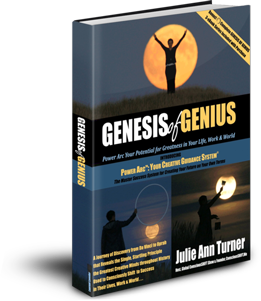 Genius, as told by the ancients, was a word derived from "genii". 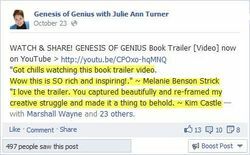 People had the blessing of genius visiting them, rather than owning it as an identity of self. 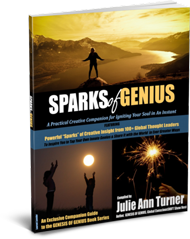 This is a big difference of perspectives, and also a hidden key into unlocking the secrets of true genius and inviting it into one’s life. But man was not perceived as a passive player in these dances with "inspiration"… the very word is taken from inhaling spirit into one’s being, receiving genius as spiritual breath, or in giving breath to something or someone. it can only blossom when received and given. The Toltecas have a word for this, they call it "Teocalli". Profound practices for inviting Spirit to become a conscious partner in navigating one’s life abound. But one of the most ancient, taken from the Greek mystery schools, was called Epotic learning. It meant recognizing that the opportunity for conscious conversation with the Divine is not only possible, but poses a constant invitation. Ancients on all continents would begin by drawing a circle on the earth, leaving the student to ponder on what lesson awaited discovery inside that circle. Modern practices include writing down questions facing one’s life and the answer, when it arrives, be it in a movie, song, or on the tongue of a friend. These practices, when sustained, help train the mind to become conscious of not traveling on the river of life alone. The childhood song, "Row, row your boat, gently down the stream, Merrily, merrily, merrily, life is but a dream" actually comes from an ancient Egyptian phrase speaking about lives being like boats on the stream of life. We have the option to remain asleep or to actively "row" consciously, working with Spirit’s currents in co-creating the "dream" of our shared reality. By actively cultivating, recognizing, then sharing, inspiration, it begins fractaling, like the nautilus shell. Like the dervish who suddenly cannot do anything but spin into greater and greater cycles of expanding consciousness, our own lives will do so as well, inviting genius to take full time residence in our very being! 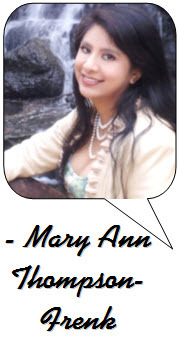 Mary Ann Thompson-Frenk, Co-Founder/President of The Memnosyne Institute, President of Thompson Fine Arts, Inc., Executive Committee Member of NEXUS Global Youth Summit, President of John Philp Thompson Foundation, Vice-Chair of Giordano Bruno University; helped negotiate first alliance in 300yrs between Hopi/Navajo nations; international public speaker; author, and award winning sculptor.